I spent my morning today in Cold Spring, NY. Such a charming town. 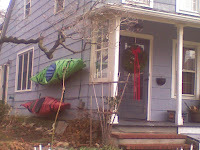 This house is so beautiful with the kayaks hanging outside. It's exactly right. 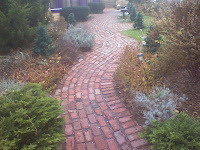 And the curved brick path- wonderful feng shui. Notice the path actually goes straight, but was artfully crafted to meander. Awesome. I can't wait until we have a house to make brick walkways and hang kayaks. I think we'll need a few kayaks first- I sold mine in order to buy Baby. So pretty. You can use mine when you want. My kayaks are sort of hanging impotently in my garage. Why am I the only person who ever posts comments to your blog, btw? I don't know. I get more emails about my blog than comments ON my blog. Such is life. I like kayaks. Let's go together some day! I used to run the Chattahoochee River in GA- up to class III is ok with me. Let me think about this. Do I really want to take an impotent kayak on the river? Doesn't exactly sound sea worthy. It's up there with my desire to never get in a flaccid canoe. Flaccid canoe is the name of my band.